Monarch butterflies, found across much of North America, have been laying eggs on milkweed plants all through Spring and Summer. Monarchs migrate in the fall because they can't stand the freezing temperatures in North America, and their food plants (particularly for their larvae/caterpillars) don't grow in winter. The monarchs that live East of the Rocky Mountains will migrate to Mexico (sometimes Florida) and hibernate in oyamel fir trees. Monarchs that live West of the Rocky Mountains will hibernate in California's eucalyptus trees. The last generation born in the Fall, before cold weather sets in, is the brood that migrates south for winter. Their migration journey could be up to 3,000 miles long! This is the only insect that truly migrates to a warmer climate. The monarchs always return to the exact same tree in Mexico, Florida, or California every year, without fail. This is partly what has caused concern for their populations, because many of their trees are in areas of logging and deforestation. Eastern monarchs overwinter in 11 or 12 specific mountain areas in Mexico and Michoacan from October to late March. These mountains can be up to 3,600 meters above sea level, and are the perfect micro-climate for butterflies, so that they do not have to use their fat reserves, and can live all winter. 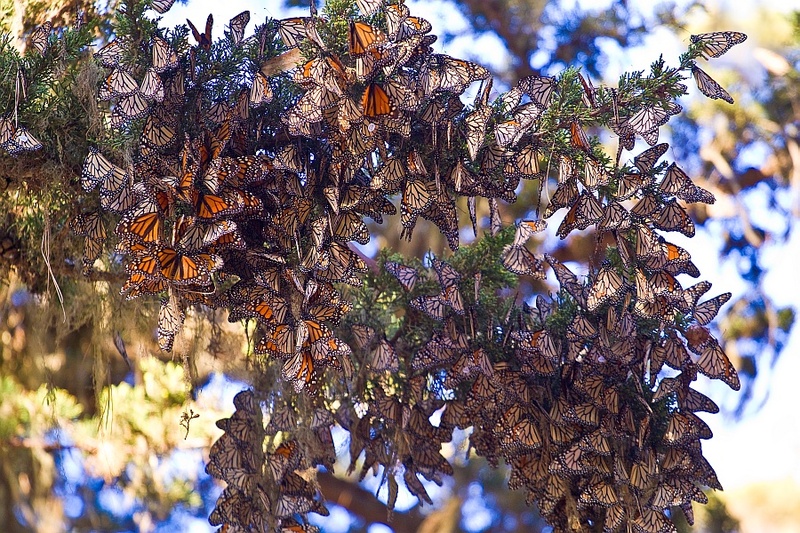 Tens of thousands of monarchs can cluster on a single tree. Now this is where the misconception comes in: It's not just one butterfly that migrates south in the Fall and then returns to the same place again in Spring. Rather, it's more like a track and field relay race, with up to five generations of butterflies making this trek. The average lifespan of a monarch is about 5 weeks, but the final brood of monarchs born in the August (late Summer/early Fall) lives an amazing 8 months! This is an incredible adaptation that allows them to migrate and survive through winter. 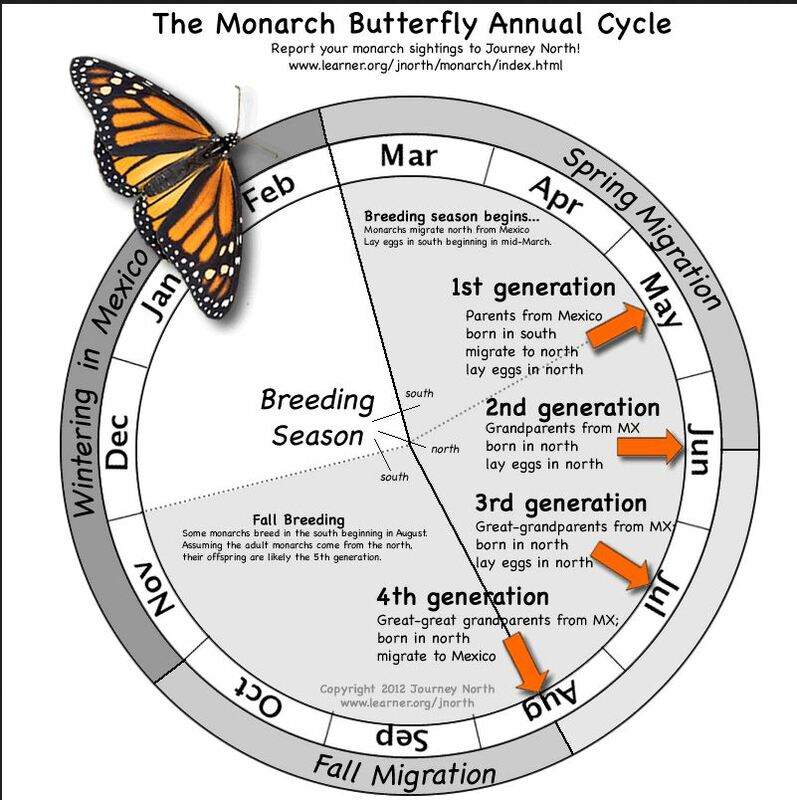 Monarch annual life cycle (Photo: Journey North). 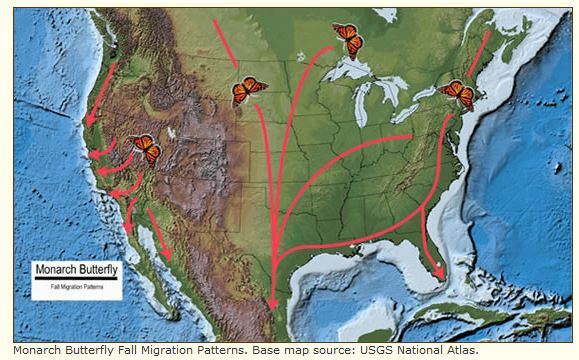 This diagram starts the migration cycle in March, with the first generation (or relay team if you like the analogy) of butterflies leaving Mexico, flying North, and then laying eggs in the American South, between March and May. This generation is the same brood that hatched out last fall, migrated, and overwintered on their trees in Mexico or California. This is why their generation lives 8 months, so they can hatch, migrate, overwinter, and then lay eggs in Spring before they die. The first and second generations migrate steadily North, following flower blooming and host plant growth, most important being the milkweed. By the 3rd generation (relay team) the butterflies have spread out through North America and are busy laying eggs and feeding. They are the great-grandchildren of the monarchs that migrated south last year. The 3rd generation will lay their eggs in late summer, and this brood will hatch to become the butterflies that will migrate south, and live 8 months, to continue the cycle. One has to wonder about the memories born into these tiny insects to know the route back to their ancestral home, and more astounding than that is that they find the exact tree their parents lived on. 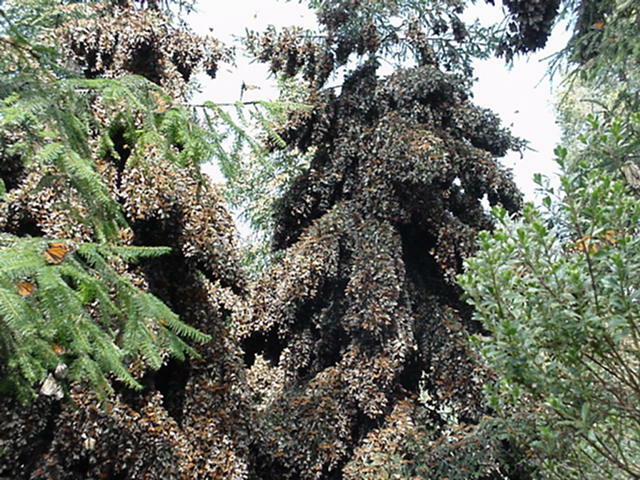 Monarchs roosting in trees in Mexico (Photo: Wiki Commons). 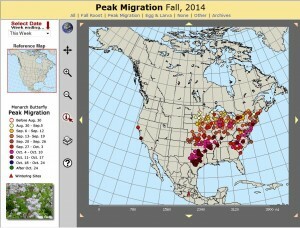 Monarch migration is a true miracle of nature, relay or not, and unfortunately climate change and human influence is greatly affecting monarch populations. As the climate warms the butterflies get "mixed signals" about when to migrate, and their host plants may not be there for them (or they may already have grown and died). 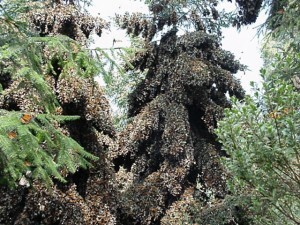 Additionally the overwintering grounds of monarchs are threatened with deforestation. Climate change may also affect the specific microclimates that the butterflies need to overwinter. These little butterflies face much more than a long migration journey. Journey North: This is your go-to place to find facts, lesson plans, interactive maps, citizen science opportunities, kids pages, reports, and more all about monarchs. I especially like their integration of citizen science, mapping, and lesson plans (including geography and math). 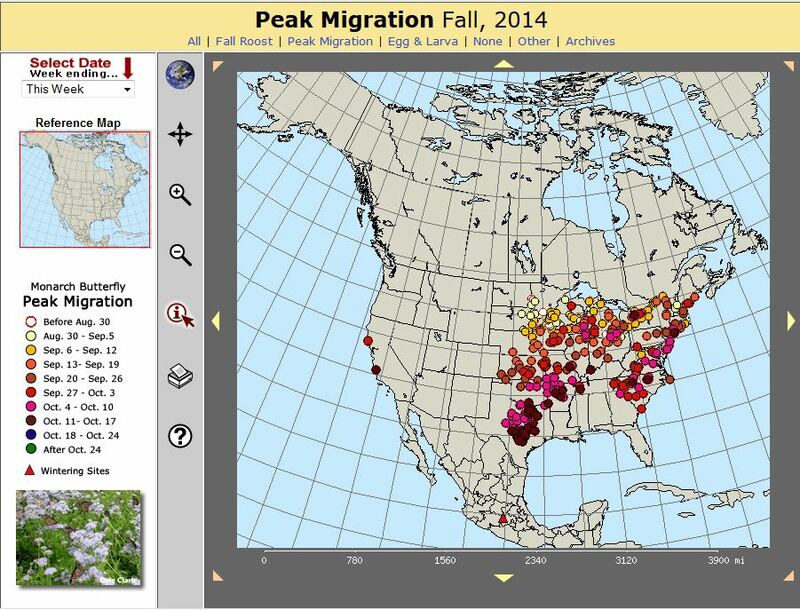 An example of the 2014 Fall monarch migration sighting map from Journey North's Citizen Science program (Photo: Journey North). Monarch Watch: If you'd like to help tag monarchs. 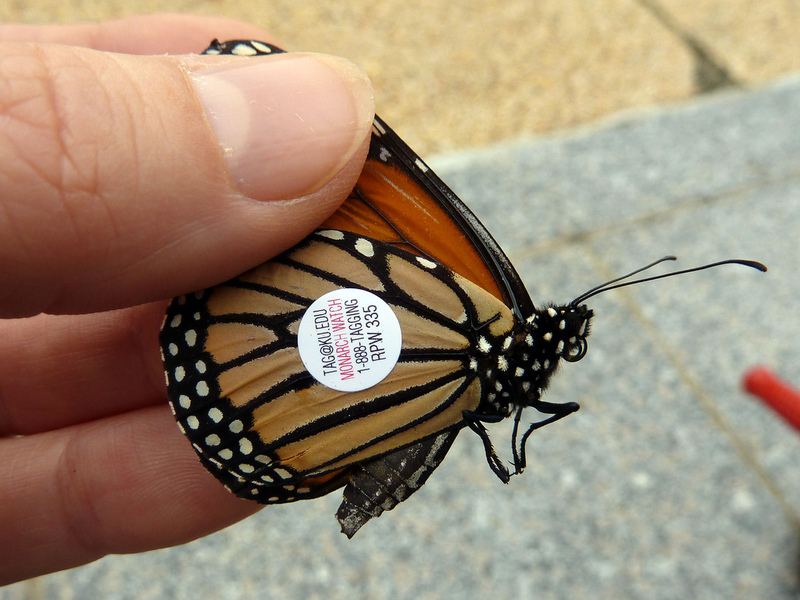 Yes, they do make very tiny little tags and give you instructions, then check out Monarch Watch. For those of you that want big data sets for classrooms or number crunching, this is also your go-to source. They have an online store called Monarch Watch Shop where you can buy the tagging kits and supplies. A monarch butterfly with a tag (Photo: Katja Shultz, Flicker Sharing).